1. Mix the turkey mince and the chutney together with your hands. Season and mould into 4 flat burgers, then chill for 10 minutes. 2. Heat the oil in a large frying pan and fry the burgers for 3-4 minutes each side until golden and cooked throughout. 3. Meanwhile, mash the avocado flesh with the mayonnaise and season. 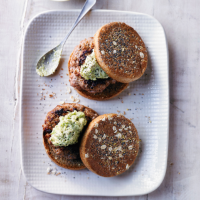 Place a burger in each toasted muffin and top with the avocado. Serve with salad.